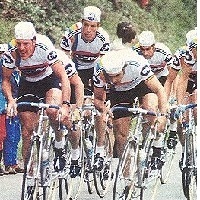 Eight times a year you can compose your own cyclingteam in the Cycling Battle. All riders have a value (points) that corresponds with his performance during his cycling carreer. Your team has a budget to buy riders.
. You compose a complete team for every period.
. You play one or more periods of your choise. The riders of your team can gain points in the Cycling Battle during the races in each period. In higher valued races more points can be earned than in lower valued races. At the website you can observe the results of your team every day by means of tables and rankings. At the end of a period the team that has the most points will be the champion of the period. At the end of the year the most succesfull team wins the Cycling Battle. If you're not playing yet, please subscribe. You can start at the beginning of every new period. Login: Username Password Forgotten your password?